The goal of the Burj Khalifa was not simply to be the world’s tallest building; it was to embody the world’s highest aspirations. By necessity, such a lofty project goal required pushing current analyses, materials, and construction technologies – literally – to new heights. Standing at 828 meters, the tower is the tallest building in the world, topping all three categories as defined by the Council on Tall Buildings and Urban Habitat. The project represents the collaboration of literally thousands of people from across the globe, all striving to build a structure which pushes the limits of our current technology in order to create something never before seen. The Burj Khalifa’s design required intense collaboration between architect and engineer. In order to enable the tower’s extreme height and promote the most efficient use of space, the team created a new structural system. Named the “buttressed core”, each of the three wings buttresses the others via a six-sided central core, forming a tri-axial, “Y” shaped plan. The building’s shape and structural systems are the result of a deliberate effort to manage wind and gravity—the two dominant considerations in the design of tall buildings. An extensive series of wind tunnel tests, combined with “tuning” the structure, enable the achievement of a building of unprecedented height. These efforts were united with the latest construction technology, culminating in the grand opening of the tower in 2010. By combining cutting-edge technologies with efficient design principles, SOM has created a vertical city that has become a model for the development of future urban centers and speaks to an ever-growing global movement towards compact, livable urban areas. This lecture will provide an overview of the engineering features of the world’s tallest building, as well as discuss the challenges faced in designing this unique and unprecedented structure. 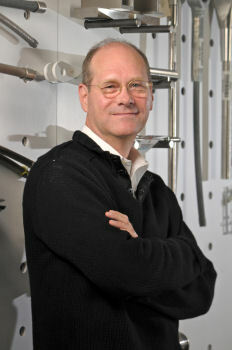 WILLIAM F. BAKER is the Structural Engineering Partner for Skidmore, Owings & Merrill, LLP (SOM). Throughout his distinguished career, Bill has dedicated himself to structural innovation—most notably in the design of tall buildings. His development of the Burj Khalifa’s “buttressed core” structural system has ushered in the new era of the supertall building. At 828 meters, the Burj Khalifa is the world’s tallest manmade structure, eclipsing its immediate predecessors by over 300m. According to the Council on Tall Buildings and Urban Habitat (CTBUH), three of the world’s ten tallest buildings are credited to Baker and his team: Burj Khalifa, Zifeng Tower, and Trump International Hotel & Tower. While widely regarded for his work on supertall buildings, Mr. Baker’s expertise also extends to a wide variety of specialized structures, including the GM Entry Pavilion and Millennium Park’s Jay Pritzker Pavilion and BP Pedestrian Bridge. He is also known for his work on long-span roof structures, such as the Korean Airlines Operations Center, as well as for his collaboration with artists, including Jamie Carpenter, Iñigo Manglano-Ovalle and James Turrell. In addition to working at SOM, Bill is actively involved with numerous institutions of higher learning, as well as various professional organizations. He is the 2011 recipient of the American Society of Civil Engineers’ (ASCE) OPAL Award, recognizing lifetime achievement in design. Mr. Baker has also received the Gold Medal from the Institution of Structural Engineers (IStructE), and was the first American to receive the Fritz Leonhardt Preis (Germany). In 2008, the CTBUH awarded him the Fazlur Rahman Khan medal. Mr. Baker is a Fellow of both the ASCE and the IStructE, and frequently lectures on a variety of structural engineering topics within the U.S. and abroad. President Robin Taylor called the 2,289th meeting to order at 8:22 pm October 14, 2011 in the Powell Auditorium of the Cosmos Club. Ms. Taylor announced the order of business and introduced five new members of the Society. The minutes of the 2,288th meeting were read and approved. Ms. Taylor then introduced the speaker of the evening, Mr. William F. Baker of Skidmore, Owings & Merrill (SOM). Mr. Baker, who is the Structural Engineering Partner at SOM, spoke on "Engineering the World's Tallest Building: The Burj Khalifa." Mr. Baker began by discussing his early involvement with the Burj Khalifa, beginning when he met with the client in the Spring of 2003 and they requested the world's tallest building. He explained that the mythology of tall structures existed long before tall buildings were technically possible. The development of structural steel framing and elevator emergency brakes led to the world's first skyscraper in 1885, the 42 meter high Home Insurance Building in Chicago. Today, the Burj Khalifa stands 828 meters, slightly more than half a mile high. The Burj was finished in October 2009 and opened in January 2010, making SOM responsible for three of the top ten tallest buildings in the world. The historical timeline for skyscraper construction shows a plateau in total height between about 1970 and today. Mr. Baker noted that the Burj required a new paradigm called the "buttressed core," referring to the Y-shaped floorplan, to address the challenges posed by very tall buildings. Mr. Baker explained that the building core is a symmetric hexagonal enclosure, which is very resistant to twisting. The walls act to take the shear loads while the flanges take the flexural load, like an I-beam with a top and two bottoms. When there is a large wind force against one side, it is naturally resisted by the building's opposite arm. Mr. Baker has found that simplicity is important in structural systems and that it takes a lot of work to reduce your proposal to its essence. He indicated that the major walls are about the same thickness throughout the building, but they increase overall stability by pushing out towards the bottom edge of the structure. Mr. Baker noted that vertical transportation was another key issue since maximum elevator cable strength limits their height to 500 meters. Therefore, large shuttle elevators service vertical zones and then local elevators service each zone. He made the analogy with taking a high speed train to go to a city, then a lower speed train to reach a town nearby. This was accomplished using a total of 34 elevators and 19 shafts, requiring a difficult process of space optimization. He later remarked that a trip to the top of the building would take about two minutes. The building facade consists of stainless steel and high performance, semi-reflective glass. Mr. Baker explained that the building's shape allows no more than one sixth of the building to ever be in direct sunlight, which is important for energy management. Additionally, the surface of the building changes shape twenty four times as it rises in order to mitigate wind pressure. Like a fluid, air swirls to one side then the other in an unstable way as wind hits the side of a tall building. This creates an oscillating pressure differential across the tower which could lead to disaster if the frequency approaches the building's natural frequency, transferring energy like a child on a swing. Extensive wind tunnel testing with scale models and a thorough estimation of local wind climate and velocity profiles were used to ensure tower stability. The Burj is built of reinforced concrete, though at the very top it transitions to steel. This modern, dense concrete uses viscosity agents with only enough water to enable the required chemical reaction and is very strong. The concrete mat at the foundation is 3.7 meters thick and 194 piles go about 45 meters into the sedimentary rock. The tower was then constructed like a vertical factory, pumping concrete upwards to construct each level out of relatively simple slabs, walls, and columns. Mr. Baker stated that he is proud that exotic solutions were not required for the Burj, he believes that it is important to design from first principles. He elaborated that while his engineers do use computers for detailed modeling and simulation, at first he prefers they be firmly in control of the issues of scale. The gross floor area of the Willis tower in Chicago scales as the cube of the height but the gross floor area of the Burj's design scales as the square of the height, which is why it was possible to construct. He then showed a series of stunning photos from the final stages of construction and the grand opening, concluding with credits to the owner, project manager, architects, general contractors, and wind tunnel sites, all of whom together made the Burj Khalifa possible. In response to a question concerning a theoretical maximum for skyscraper height, Mr. Baker explained that there is a strength limit for specific materials but that the pressures can be efficiently managed as long as the structure continues spreading out towards its base. However, he believes a hypothetical mile high building would also require a slightly different design. Someone wondered what Mr. Baker might have built with the same budget if the client had not specified they wanted the tallest building in the world. Mr. Baker stated that he would have tried to do the most with the least, emphasizing efficiency in design and construction, and creating value for the surrounding area. A final question concerned Mr. Baker's thoughts on the American educational system. Mr. Baker explained that he would like to see a return to first principles reasoning and theoretical foundations, a potentially post-computational age. He elaborated that it is important to be very well versed in theory to synthesize new ideas and understand what to analyze. After the question and answer period, Ms. Taylor thanked the speaker, made the usual housekeeping announcements, and invited guests to apply for membership. At 10:08 pm, she adjourned the 2,289th meeting to the social hour.